Home News Politics Gov. 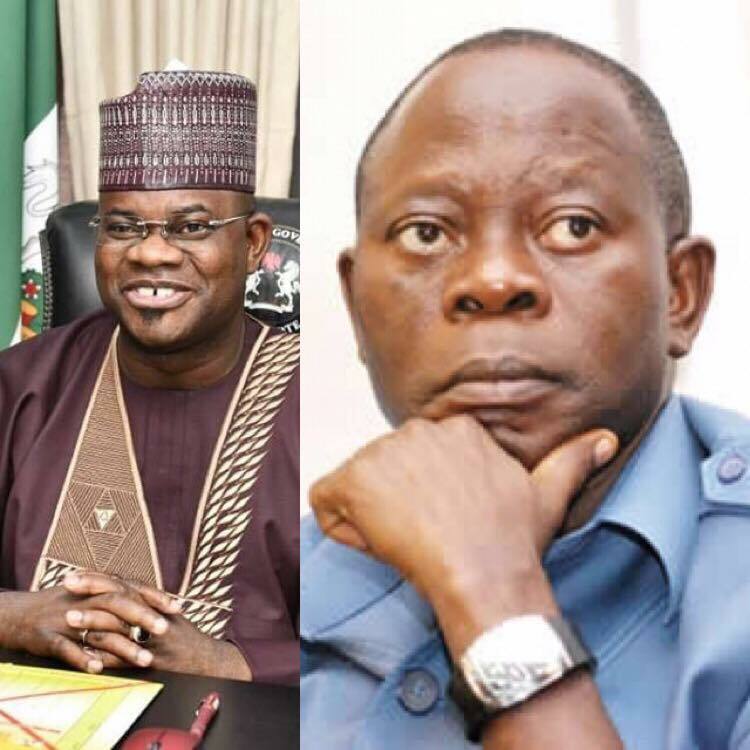 Yahaya Bello Felicitates With APC’s National Chairman, Adams Oshiomhole AT 67. Gov. Yahaya Bello Felicitates With APC’s National Chairman, Adams Oshiomhole AT 67. Yahaya Bello & Adams Oshiomhole. The Governor of Kogi State, Yahaya Bello has sent his warm felicitation message to the National Chairman of All Progressives Congress (APC) His Excellency Adams Eric Oshiomhole on his 67th birthday, April 4th, 2019, while describing him as a pragmatic leader with rare vision. Governor Bello joins members of Oshiomhole’s family and the APC in celebrating the former union leader and governor of Edo State for his uncommon wisdom, resilient, pragmatism and exemplary leadership which he said has strengthened the nation’s democracy. While rejoicing with family members, friends, political and business associates of the former Edo Governor on this rosy milestone, the governor said Oshiomhole has had a remarkable life that is great in accomplishment and great in years. ”On behalf of the government and the good people of Kogi State, I wish to felicitate with Your Excellency on the occasion of your 67th Birthday celebrations. ”As the National Chairman Of our great party; the APC, you have exhibited uncommon wisdom, resilient, pragmatism, and exemplary leadership to deserve our greatest respect for the stability you have brought to our party. You have had a remarkable life that is great in accomplishment and great in years. ”Over the years, you have made extraordinary memories and written your own unique story into the Nigerian narrative. As you reflect on your contributions to our nation and humanity at large, we trust you take tremendous pride in all you have accomplished”. ”Happy Birthday, Adams Eric Oshiomhole”. Oshiomhole was the Secretary Of The Nigerian Textile Union, He was President Of the Nigerian Labour Congress, NLC under President Olusegun Obasanjo and was two- term Governor Of Edo State, South South Nigeria.